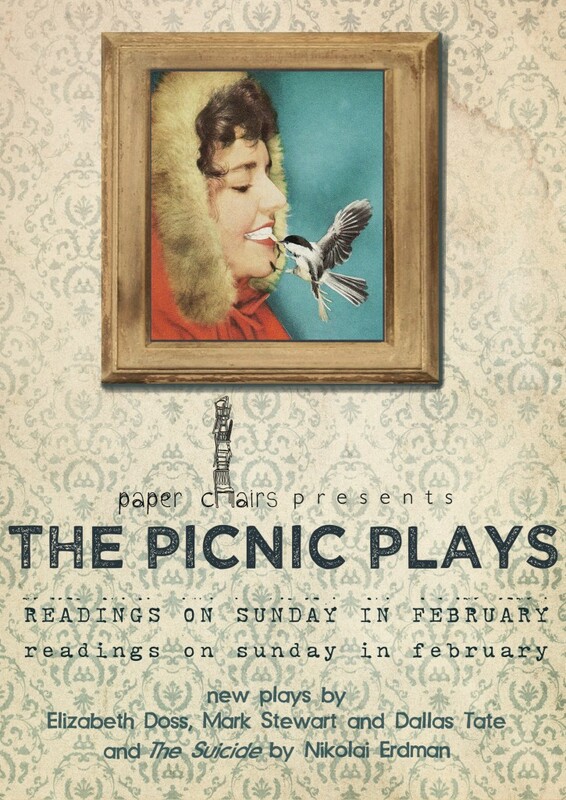 Each Sunday in February you’re invited to pull up a blanket someplace cozy and give listen to a play we think has promise, with a lively discussion to follow. This series will feature works by local writers Mark Stewart, Dallas Tate and Elizabeth Doss and will also include, The Suicide, by Nikolai Erdman. Each reading will take place in a well-suited spot and will feature stellar paper chairs talent. Mark your calendars! Mark Stewart’s, Bomb Shelter: Or the Modern Pinnochio, finds Mike and Kris, a young couple, locked in their bomb shelter with enough rations to live out the rest of their days. But someone forgot to pack anything to pass the time. No games. no books. nothing. So, they must entertain themselves, and you in the process. A dramatic satire by Russian playwright Nikolai Erdman written in 1928 during the height of the Stalin era, the story follows unemployed Semyon Semyonovitch who decides to kill himself and the flock of vibrant characters that descend on him, each lobbying to dedicate his death to a different cause. A fantastical farce with a large boisterous cast and irreverent juxtaposition of melancholy and fast, comic energy, The Suicide raises timelessly topical questions of how humans fail to thrive in a less than civil society. Dallas Tate’s Therapy 11LV42 is set in the not terrible distant future and follows two men cohabitating in a strange environment. Roy knows much more about “the world” than Leon and is hesitant to discuss such matters. Inevitably, the two men realize the reason for their internment and that reason puts them at odds – with each other. Murder Ballad Murder Mystery features legendary killers held in purgatorial Ghost Town doomed to relive their crimes day in and day out. Corralled within the Ghost Town wall and guarded by one trusty Sheriff, they haunt and torture one another relentlessly. But when the Sheriff oversleeps her siesta, the renegades make a clean break from Ghost Town and travel back to the real world to wreak havoc on mere mortals. Now the startled Sheriff must rely one shady Snake Charmer to bring the dead and dangerous back where they belong. Hold onto your hats folks. This one’s a musical. check out one or all four – see you there!